Award winning garden mosaic is up for auction. Bid now! 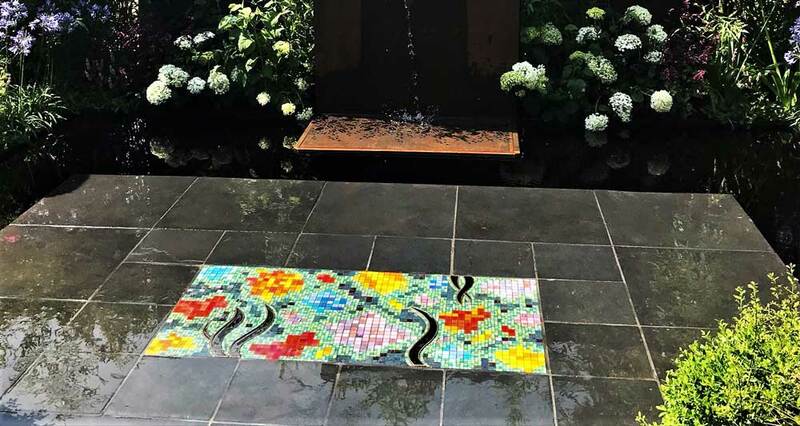 Arts4Space, the community arts organisation, is auctioning off the mosaic that was part of an award-winning garden designed for the 2018 RHS show garden ‘Brilliance in Bloom’. The on-line auction runs until 10pm 12 December. You can bid and follow the auction here. The mosaic was created in collaboration with the community art organisation Art4Space and feelance artist Nickie Bonn to come up with an abstract modern piece with the brief of ‘riot of fun’. The mosaic along with the planting were the highest scoring elements in the garden gaining an overall Silver Medal. Arts4Space say: “The original piece of art contains, now obsolete, vintage Italian glass and sweeping flames of antique bronze mirror to reflect the light and shadows. This geometric design brings colour to any outside space, all year round. The mosaic can easily be attached as a wall piece or for a floor/garden. . The measurements of the mosaic are 1200 x 600mm and 23mm depth. Bid now. More about the ‘Brilliance in Bloom’ garden here.